A couple days ago me and my buddy called in sick from school. We Then went out and got an Industrial roll of suran wrap. we also had about 35 traffic cones. We then went back to school and parked by our victim's car. 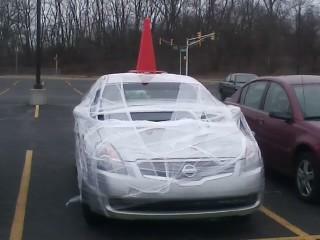 knowing he leaves his car unlocked, we filled his car with the cones. We Then began to wrap around the car over and over again. After a while it was copletely covered and you could hardly see in. We continued to wrap and then topped it of with the largest cone we had. 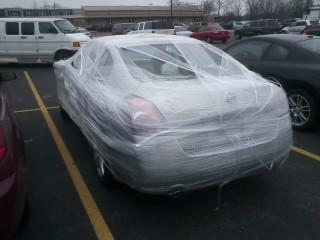 This is a great way to get a prankster back and to make sure he is late for whatever he has planned for after school.